Spring Sale thru 3/24 - All Spring furniture trends are on sale. 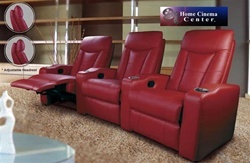 Coaster COA-5002-3 Director Leather Theater Sectional - - Director theater sectional from Coaster is sure to enhance any home theater experience. (3) adjustable chairs each feature a solid hardwood frame, sinuous spring construction, pillow top seat cushion.